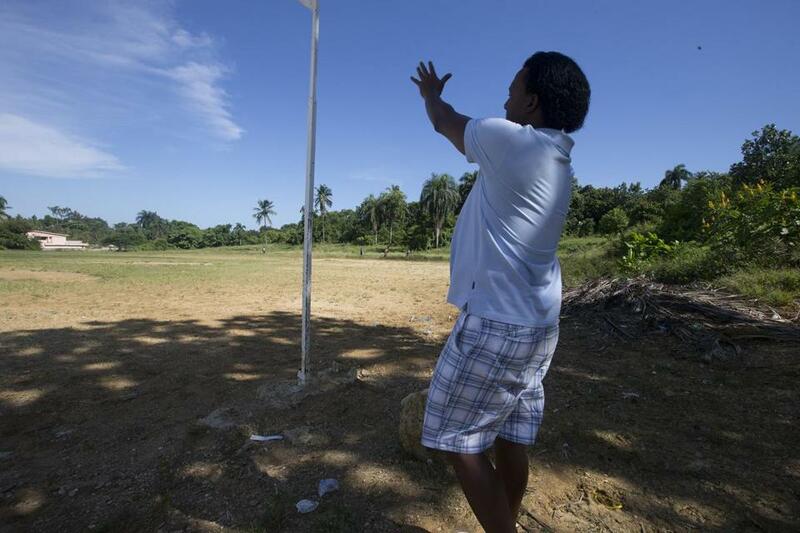 EL MAMON, Dominican Republic — Pedro Martinez wraps his long, elegant fingers around the handle of a Stanley hammer, grabs a nail, and starts pounding away. He’s helping rebuild a rusty tin-and-plywood shack for an old woman who raised six children there by herself. For Martinez, who had five brothers and sisters, it is a flashback to poverty. “That brought me back to my days as a kid,” said the three-time Cy Young Award winner. “Seeing the wood, seeing how rotten it is. The smell of the house, the wind coming into the house. Everything. Martinez has shown up, unannounced, to help the 20 high school students from the US and the Dominican who have joined together to do community service and play baseball, part of the Lindos Suenos (Beautiful Dreams) program run by the Red Sox. Spend a day with the wildly impulsive Martinez and a portrait emerges of a Pied Piper, committed to helping his fellow Dominicans, one kid at a time. 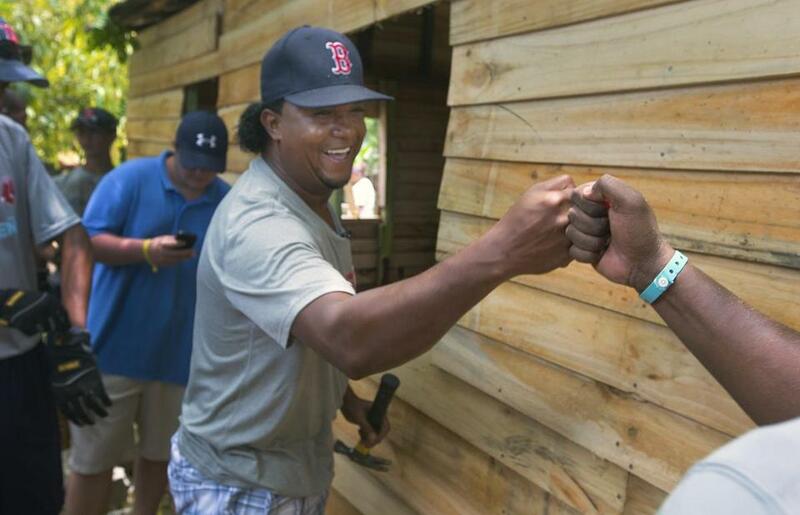 The Pedro Martinez and Brothers Foundation, headquartered on the outskirts of Santo Domingo, helps impoverished youths in his hometown of Manoguayabo. He is as passionate about it as he is about baseball. Jesus Alou, director of the Red Sox Baseball Academy, said Martinez has the heart of a lion. “I admired him as a player, but to me he’s a better superstar as a human being,” said Alou. “Now he’s donating to that family several new, comfortable beds. That’s the way he is. He believes in good karma. “I believe you’ve got to have it,” said Martinez. “You’ve got to have something inside of you that tells you what to do. I guess you have a soul for a reason, to tell you what’s good and what’s not. Martinez hops into the passenger side of a white Hummer with tinted windows. His nephew is driving him to the foundation, an hour away. En route, he talks not about the poverty but about the potential. He wants children to have a future. The unemployment rate in El Mamon is 70 percent. He pauses and lets the image hang in the air. “I want to be an ambassador of hope,” he says. On the road, the tropical sun beats down relentlessly from a cloudless sky. When an aggressive driver nearly sideswipes the Hummer on the highway, Martinez lowers the tinted window and tips his cap up. Road rage becomes royalty when the other driver recognizes him. Could he be elected president of the Dominican Republic? As the Hummer approaches his hometown, Martinez says that, in 1999, officials there offered to name one of the main boulevards after him. He refused, saying he wanted to honor his older brother Ramon and all the other baseball players who paved the way for him. So they named the street the Boulevard of Baseball instead. Martinez is in his element now. Here is where he ran, mile after mile, looking for the family cow. Over here is where he still sits today in the shade with an old man in an old chair, just chilling out. Here is where he threw rocks to pinpoint his control. He laughs when he recalls how he improvised because he didn’t have enough money for a ball. The shack he lived in is long gone, but the famous mango tree remains. During the 2004 AL Championship Series against the Yankees, Martinez said he didn’t mind having 60,000 fans taunt him, because 15 years earlier, he was sitting under a mango tree without 50 cents for bus fare. Martinez wouldn’t just sit under the tree, he would climb it when his parents would argue over trying to make ends meet. It got so bad he developed a heart murmur from the stress. He cried under that mango tree, but he dreamed there, too. Sometimes the mango trees dropped their fruit right on his shack, like manna from heaven. Young Pedro was just 14 when his older brother Ramon was pitching at the Dodgers Academy in the Dominican. Pedro went along to play catch. He wanted to see professional baseball players. The Dodgers were interested; they eventually signed Pedro, and he gave Ramon his signing bonus. When he was stalled in the minors with the Dodgers, Martinez says, he was offered steroids. He admits he was tempted. “Every other guy that was taller and more good-looking got called up,” he says. “It seemed like it was going to take forever. That if I had a better body or added something to my body . . . The next stop on the Pedro Tour is a sprawling tract of land where a three-story yellow schoolhouse was built so kids didn’t have to travel 6 miles to learn, as Martinez did. The future Hall of Famer also wants to build a mini-Fenway Park here someday soon. Nearby, Pedro and Ramon have built a compound of guest houses, including a swimming pool where they let foundation children practice for swim meets. But don’t ask Martinez about his family. He gives up very little information on them. As popular as he is, his wife is even more popular, he says. The complex is gleaming. It is a day care, a before- and after-school facility that includes a playground, kitchens, computers, a basketball court, and someday a vocational school. The children learn music and English, and they battle domestic violence and teenage pregnancy. “This is the holy land for them, because nobody is allowed to come in from the outside,” says Martinez. “They go home with a fresh mind. He has also built 30-40 homes and two churches in his hometown. The foundation also gives out grants. One of the first ones went to Pedro’s future wife. “It’s good for people to know I’m a recipient of the foundation,” says Carolina Martinez, who grew up nearby. She got a scholarship, played volleyball, and met Pedro when she was a sophomore at Boston College in 1998. Carolina got her master’s in journalism and worked for ESPN Deportes covering the winter baseball leagues. But after her marriage to Martinez in 2005, she eventually devoted herself full time to the foundation. She wants to start a “Sponsor a Kid” program from Boston to help expand their work to four locations in the Dominican Republic. Augusto Nicolas Martinez Placido, who also attended the Lindos Suenos program, grew up here and is a longtime foundation member. Martinez shakes off the praise quicker than he dispatched Yankees coach Don Zimmer in the 2003 ALCS. “I realized we needed to open something so that the kids could have an opportunity to find a way out,” he says. “Not all of these kids are going to be baseball players. Authored by Stan Grossfeld. Originally published in the Boston Globe.